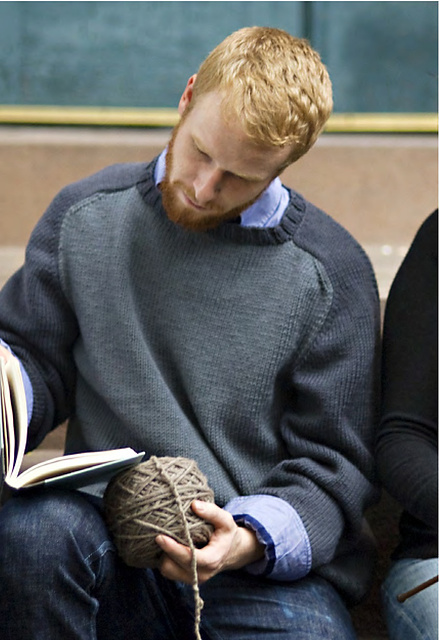 Knitting a sweater for a giant man is fast work. Did you all just faint? If you recall, I'm knitting Andrew the Baseball Jersey from Knits Men Want , out of my handspun. Photo from the book, by Jared Flood. Because I'm knitting mine SO FAST that it would be a blurry shot. I cast this on last Tuesday (11/08) right before our birthing class, literally, the INSTANT that one of the skeins of yarn was dry. (The rest were still damp, in case you were curious.) I was so stressed that my deadline would slip excited that I haven't taken a single picture of the finished skeins. Of which there is only a little left from the first batch at this point. In three hours of class, I managed to knit all three inches of the ribbing. For Andrew. Who has a 48" chest. There was a lot of self-high-fiving in the car on our way home. I even had him try it on- using the incredibly clever Try-it-On Tubing that I got as a gift last week. I don't know why, but I was surprised that it fit the way it's supposed to. I swatched. I did math. But on 24" circular needles, nothing looks big enough to circumnavigate my redwood of a husband. I was pleasantly surprised; Andrew was not. Apparently, my being an AMAZING knitter is no longer a surprise to him. That's what being together for 10 years will get you, I suppose. In one week, I've knit all 18" of the body, which is the "divide for the armholes" part. I think this is partly due to the fact that I'm working with handspun- which we all know is the most satisfying thing to knit with, ever- and partly because knitting a giant tube of stockinette stitch is possibly the most compelling knitting in the world right now. Maybe not the most compelling, but definitely the most satisfying. My brain is itching to knit a lace shawl- or maybe finish one that I've already started - but there is something really great about being able to just grab something and knit and knit and knit. It doesn't hurt that no matter how exhausted I am, I still have enough brainpower to work on this sweater. Tomorrow I divide for the front and back and do the armhole decreases. Let's just hope I don't get caught up on the sleeves. 45 days until 2012! You are so funny!!!! I almost spewed my breakfast all over the laptop screen! Good going on Andrew's sweater. Hope the sleeves go well. You yarn is lovely, I want to be you when my spinning grows up. Something tells me you are going to finish this sweater in record time. I get the same attitude from Ray; he's never impressed with things that I knit. I chalk it up to him being a guy. You could start the sleeves next time you are in class, that way, you have nothing else to knit to distract you and you should make really good progress! I am impressed! Someday I will spin and knit a sweater for my husband. For now, just knit since my spinning is not quite up to snuff. 80" wingspan on my guy, and my Aran sweater for him took me a whole lot longer than that to get that far along. Congratulations and Go Jasmin! I hope this isn't a duplicate comment- blogger decided to get all weird on me. We had a guest speaker during one of my Finance classes today. He had some sort of job with the Houston basketball area. While he mostly talked about relevant aspects of finance in his job, the most interesting thing I learned from him was that wingspan, rather than height is the best predictor for a good basketball player. His example was one player who was 6'6, but with a 7'4 wingspan. The player could pass the basket around the defense's arms. All I could think was "His sweater would take forever to knit.